Table Quiz Fundraiser next Friday night, the 7th of March, in BarrÃ³g at 8pm. 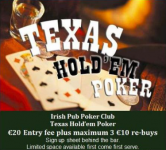 For more information contact Desi on 0870678903 . DJ after the quiz. Good luck to Vivian Brodigan who is raising money for Cancer this Sunday at 3PM in BarrÃ³g by taking part in Today FM's Shave or Dye Fundraiser. All welcome to come watch and all donations appreciated. The Naomh BarrÃ³g's Social Members Christmas Party is on this Saturday the 14th of December in the club. There will be live music from the Duvets, members drink promos all night and finger food. Hope you all can make it. 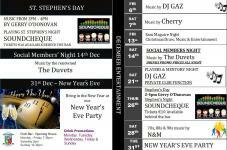 Check out all the events in the club this December. The Sam Maguire is coming to BarrÃ³g this Friday. Hope you all can make it. The DVD from the Strictly Come Dancing Night will be shown on the big Screen in Naomh BarrÃ³g this Friday the 22nd of November. Anyone who missed the night or would like to see it again are more than welcome. It kicks off at 8:30. There will be a DJ and maybe some Karaoke afterwards. Live music from a Tom Jones Tribute act this Saturday the 14th of September in the club. No cover charge. All welcome. 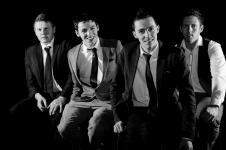 Live music from the Weavers on Saturday the 24th of August. This is another new band for the club. They play a wide variety of music. No cover charge. All welcome. Soundcheque are back by popular demand to the club. Fantastic night in the club last time they were here. You can check out some of their music on this link. Hope to see you all there on the 17th. Live music from Shake Rattle & Roll this Saturday in the club. They play a variety of music from the 50's and 60's. Kicks off at 10:30. No cover charge. All welcome. Live Bank Holiday Sunday music from Seven Deadly Skins. Always a great night when they play in the club. If you haven't seen them before, they are not to be missed. Check out some of their music on this link. Live music from Kosmic Saturday night in the club. This is a new band for the club. No cover charge. All welcome. Check out some of their music on this link.